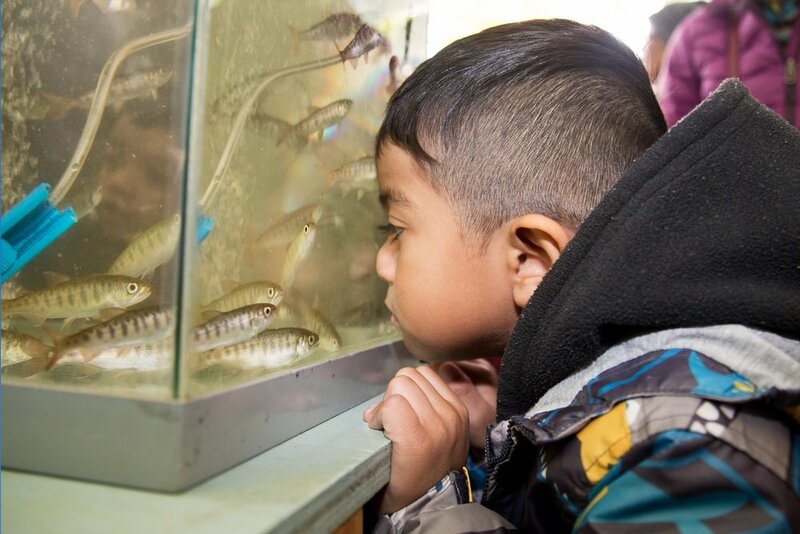 A boy releases coho salmon under the guidance of a volunteer at Hoy Creek. The weather was perfect for our annual Salmon Leave Home event on May 6! Well over a thousand residents participated. 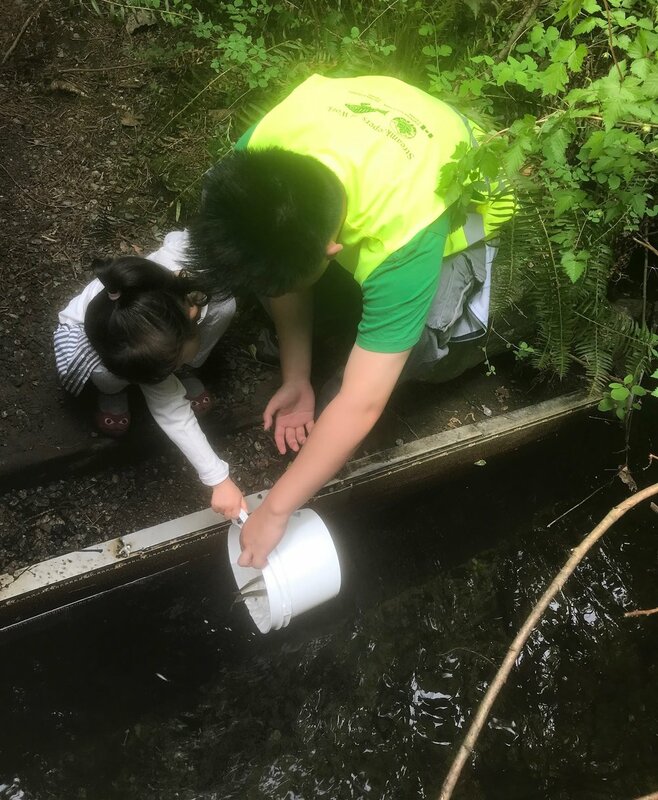 We'd like to thank everyone who came out to lend a hand and give their well wishes and good thoughts to our 5000 coho smolts who now make Hoy Creek their home. 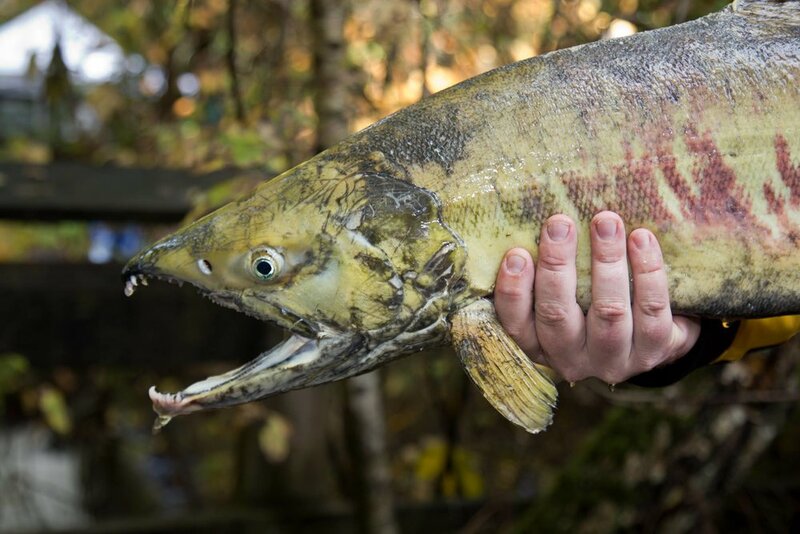 The fish will now make the creeks, or the Coquitlam or Fraser rivers their home for about a year before making it to the ocean. Patrons of Salmon Leave Home listen to Ed Hall of Kwikwetlem First Nation at the opening of the annual event at Hoy Creek. A big thank you to special guests, the Kwikwetlem First Nation who provided comment during the opening ceremony and released our first fish into Hoy Creek. 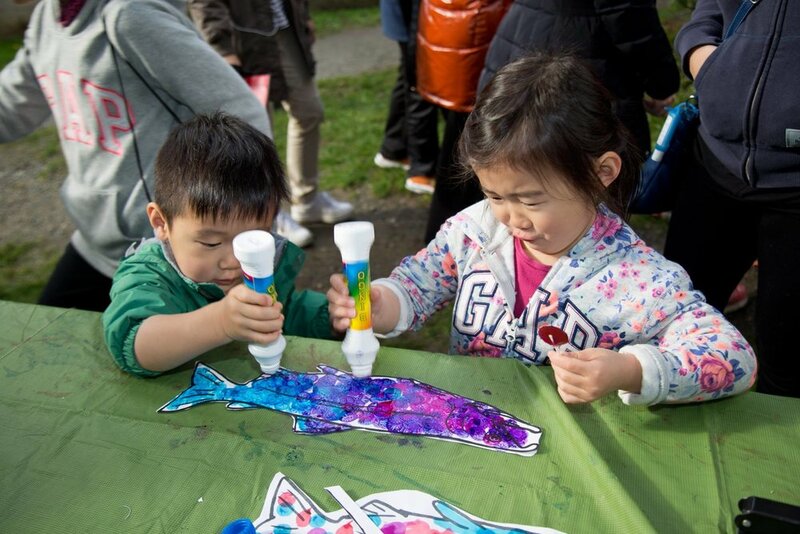 Thanks also to the Wild Salmon Caravan for providing entertainment and art activities. The kids loved painting the salmon van! The Pinetree Secondary School students were a great help on site, and also provided face painting. 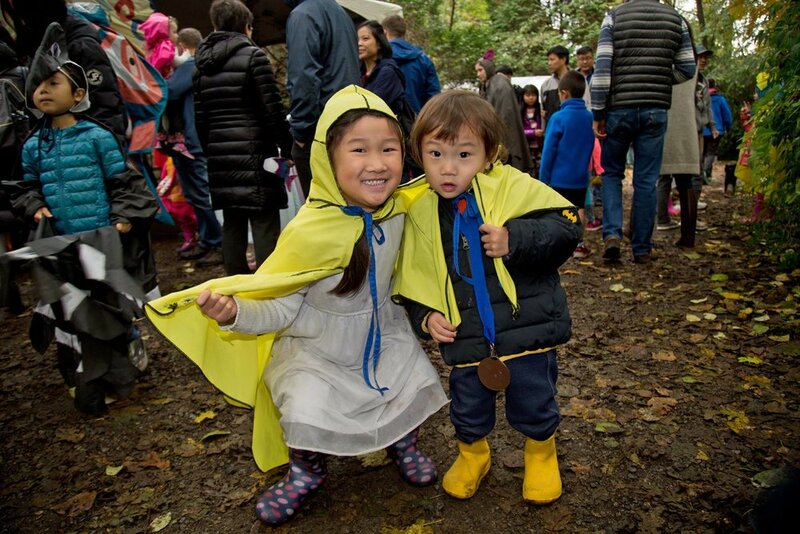 The Wild Salmon Caravan served up fishy fun. CBC News came out to provide coverage of the event on the evening news that day. After the event closed, the rearing pond was cleaned out in preparation for the next broodstock which will make the location their home in June. 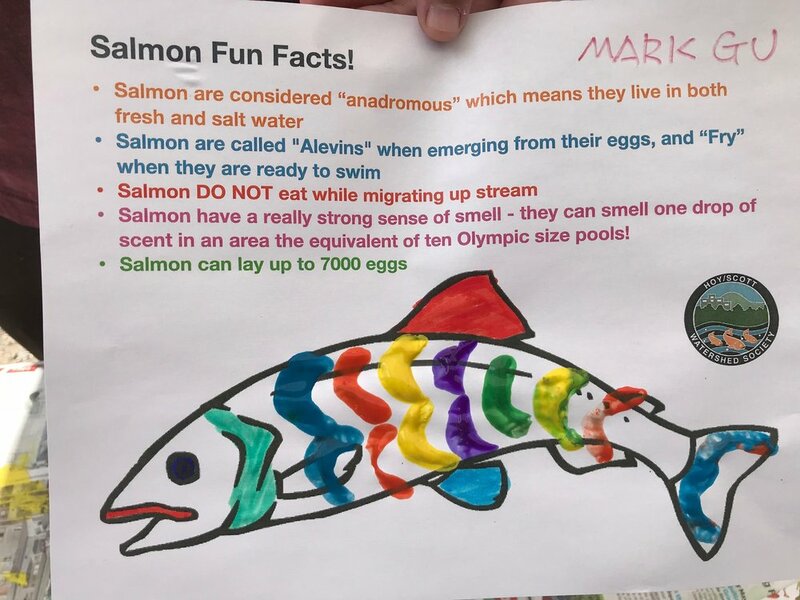 The approximately 6-month old salmon will live there until the next Salmon Leave Home event in May 2019. To view our all of our photos of the event, check out our Facebook album. If you are not a Facebook user, we have a Google photo album too. 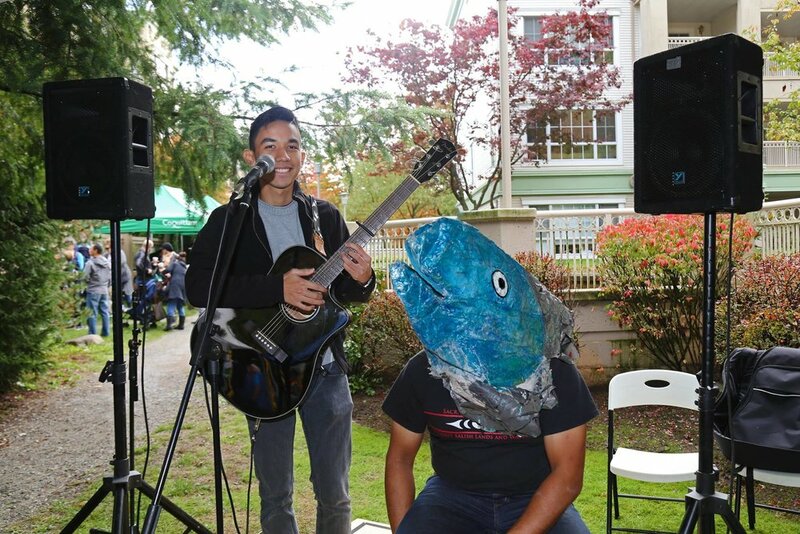 We'll see you at Salmon Come Home in October! Stewart and Chris at the Walton Elementary Earth Day event. 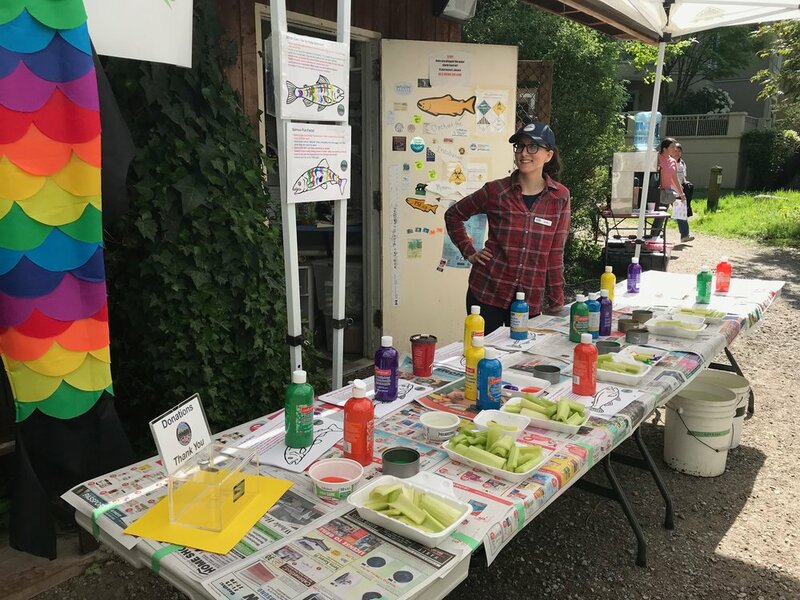 Members of the Hoy-Scott Watershed Society (HSWS) participated in the Earth Day Swap Meet event put on by Walton Elementary School on April 28. The schoo is a short walk through the forest to Hoy Creek Hatchery. 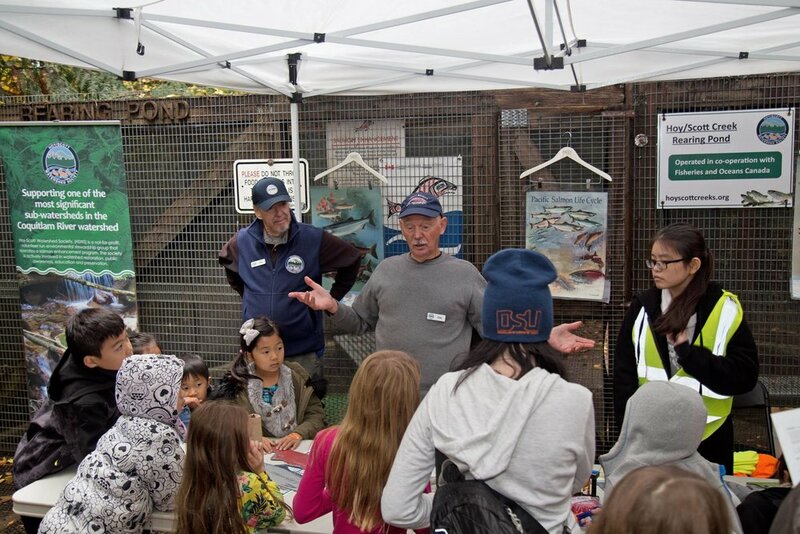 "It's important for the students, parents, and teachers to be aware of the salmon sanctuary that is so close to their school," said president of the Society, Robbin Whachell. 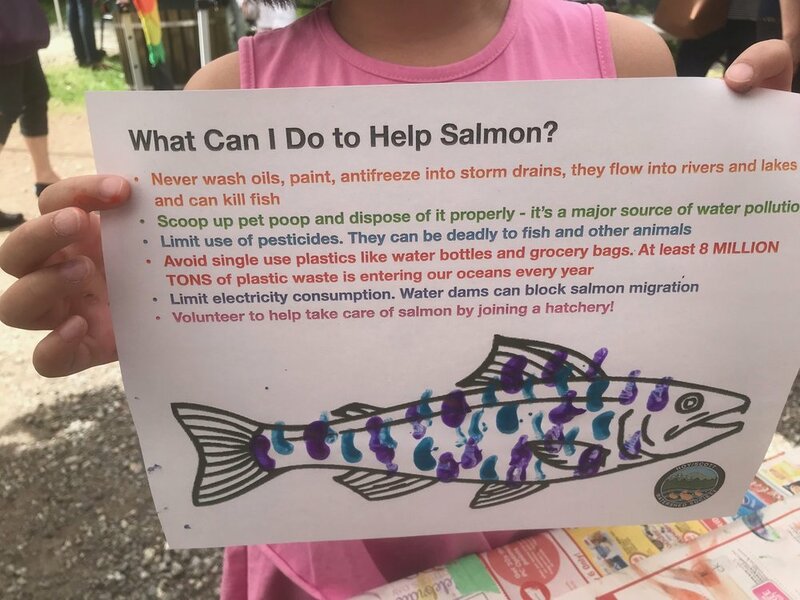 "Many of the families walk through the watershed along Hoy Trail on their way to and from school, so it's important that they have an awareness that each of us have a role to play in protecting our watershed, which in turn assists in the preservation of our salmon." 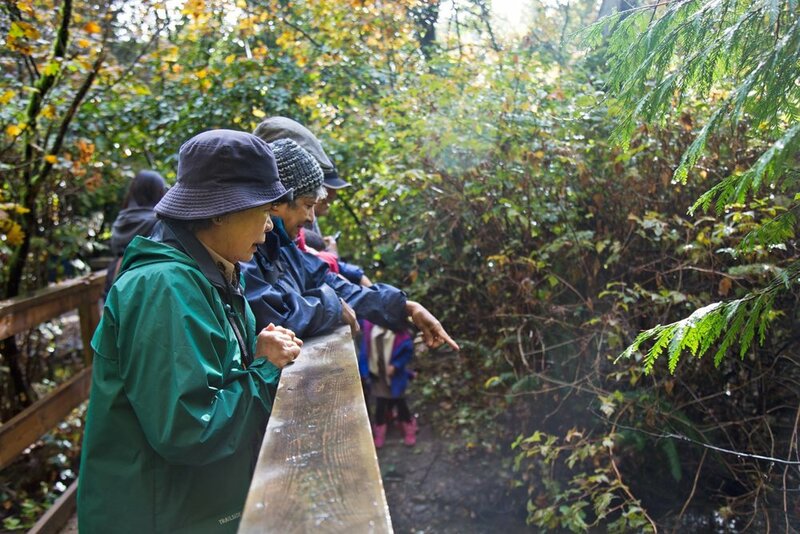 "It was wonderful to talk to parents who have observed changes in the watershed, or who have witnessed wildlife. 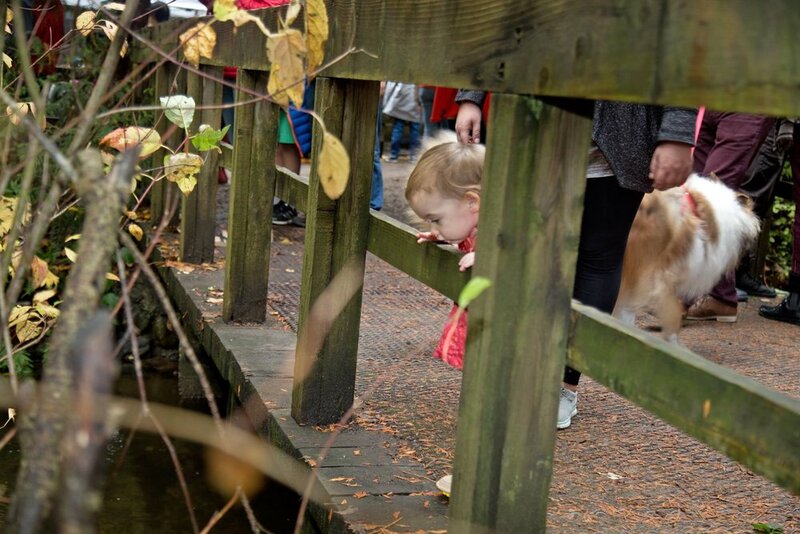 The watershed is a wonderful place to explore." A big thanks to Society volunteers, Chris Hamming and Stewart Brotchie who interacted with participants on Friday evening, and to Lani Lehun who represented the Society on Saturday with Robbin. HSWS applauds the organizers for leading an important event that not only supports their school but helps open eyes and minds to the wonders and sensitivities of our environment. 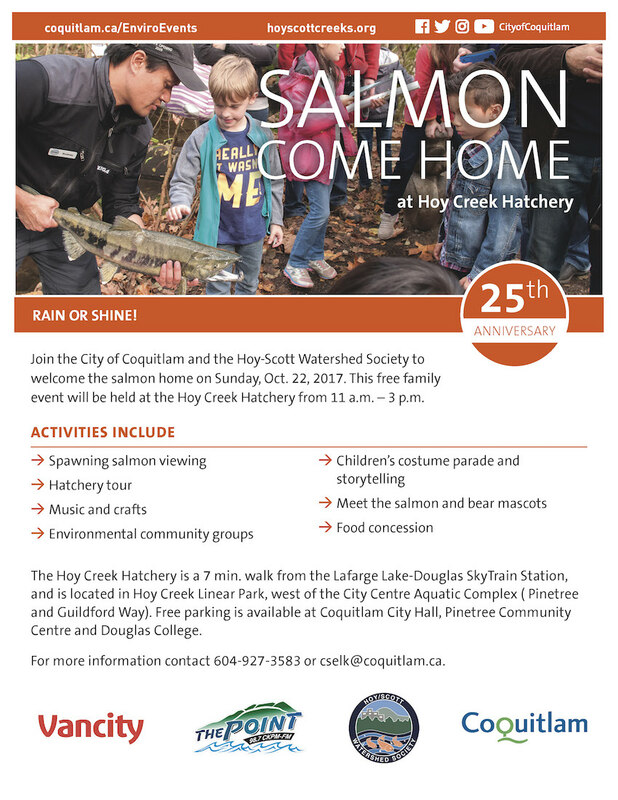 Hoy-Scott Watershed Society (HSWS) is a volunteer-run non-profit society that operates a small salmon hatchery beside Hoy Creek and conducts a salmon enhancement program in partnership with the City of Coquitlam, and with technical expertise from the Department of Fisheries and Oceans Canada. The group stewards the Hoy and Scott Watersheds, promoting public awareness and education, and is involved in watershed habitat restoration and preservation. President of the Hoy-Scott Watershed Society, Robbin Whachell presents Caresse Selk, former Environmental Stewardship Coordinator, City of Coquitlam with a certificate of appreciation on December 16, 2017, during the Socety's Christmas social. The Hoy-Scott Watershed Society held their annual Christmas social on December 16 at Milestone's Restaurant. It was the perfect opportunity to thank Caresse Selk, former Environmental Stewardship Coordinator for the City of Coquitlam. 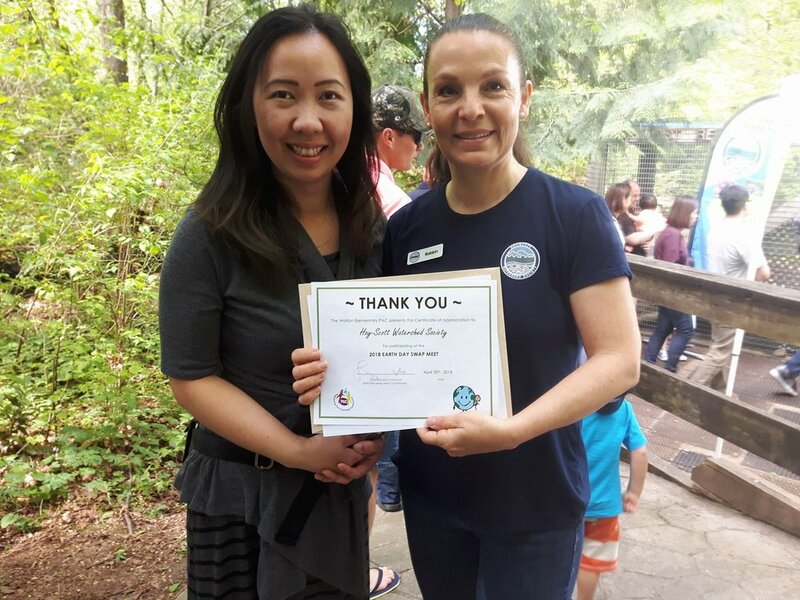 Caresse has worked with HSWS for 13 years as the key contact for the Coquitlam's signature event, Salmon Come Home, as well the Society was updated by her on creek spills, tree removals, and trail or park enhancements. 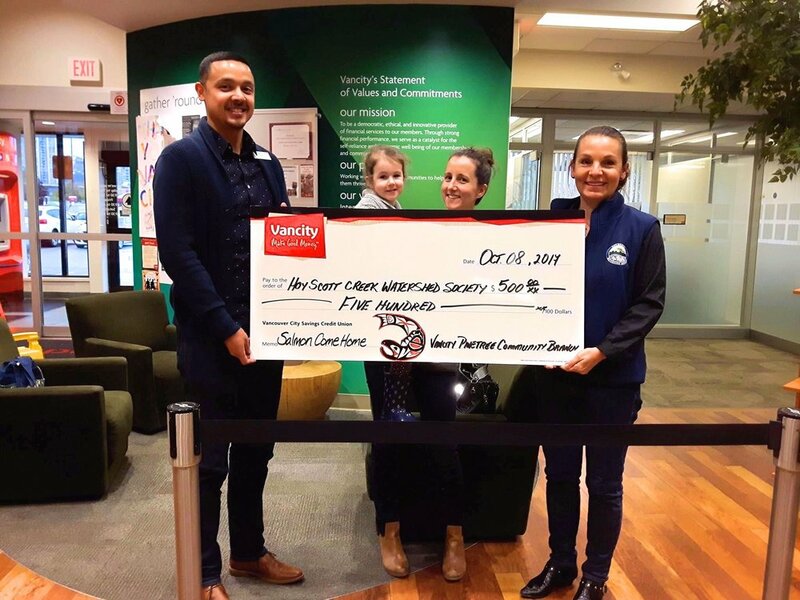 "We're going to miss working with Caresse on Salmon Come Home," said president Robbin Whachell, "but we'd like to congratulate her on her new position as Urban Forestry and Park Services Manager at the City of Coquitlam. We're happy we'll still be connected to her through her new position." Hoy-Scott Watershed Society Christmas social 2017 at Milestone's Restaurant in Coquitlam on December 16. Hoy-Scott Watershed Society (HSWS) president, Robbin Whachell spoke on Salmon and Sustainablity in Perth, Western Australia on November 25. Ms. Whachell spoke about her personal experience of discovering salmon in her city stream, and how she became involved with the Society. She also spoke about the work HSWS does throughout the year. 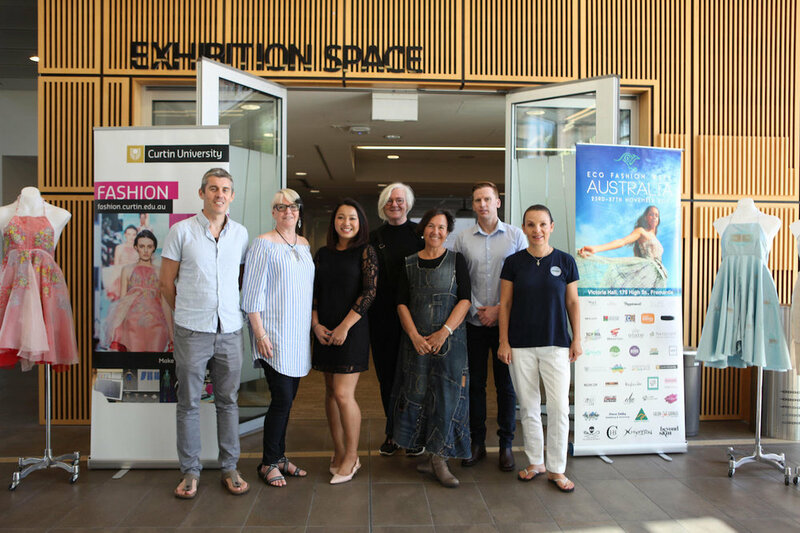 Other speakers included Edwina Huang, CEO Vivify Textiles, UK; Dr. Anne Farren, Curtin University Fashion Dept., Australia; Jane Milburn, Textile Beat Australia; Ben Lazzaro, Deputy Chief Executive and Marketing and Communications Manager, Australian Made Campaign Ltd.; and me, Robbin Whachell, Hoy-Scott Watershed Society, Canada. Photo credit to Aidan Green for Eco Fashion Week Australia. Check out this blue heron who frequents Hoy Creek for his evening meals. 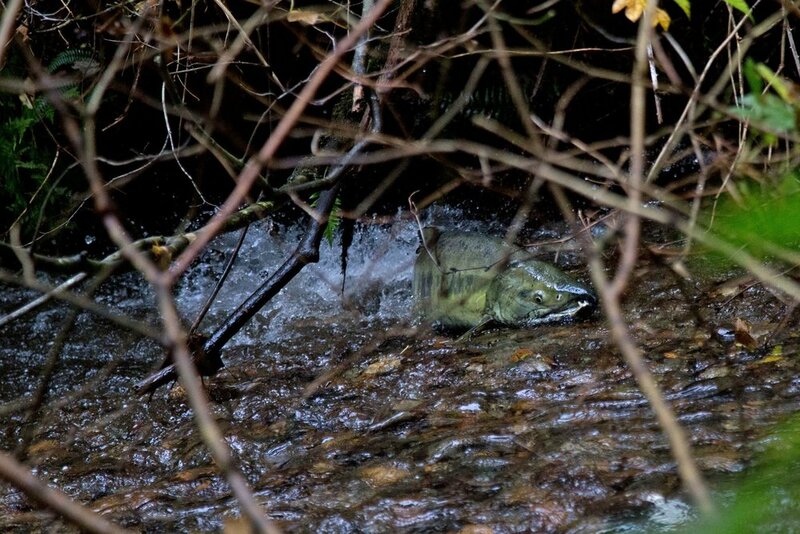 This video was taken by by the Hoy Creek salmon hatchery by a Hoy-Scott Watershed Society member. The blue heron catches a lamprey, and through patience, perseverance and careful beak skills he finally consumes his take. The snake-like lamprey put up a good fight! On Saturday, September 23, approximately 8 volunteers from of Hoy-Scott Watershed Society took part in an invertebrate survey, of which details were provided to the Pacific Streamkeepers Federation 'Streamkeepers Database.' Numerous curious members of the public, who happened to be walking by the area also participated. To start, two 30x30 cm samples were taken from Hoy Creek immediately upstream of the Hoy Creek hatchery using a D frame net designed for invertebrate surveys. Water containing the invertebrates from the creek (the samples) was divided into several wash basin sized samples. Kids and adults then patiently inspected each sample, capturing all the aquatic invertebrates using a spoon or pipette, placing them into an ice cube square according to the type of invertebrate. Nearly 400 invertebrates from the two 30x30 cm samples were counted and sorted into 12 different groups (taxa). That works out to a density of over 2000 aquatic invertebrates per square metre of creek bed! The observations were then used to conduct basic water quality and diversity assessments of the creek using several different indices (e.g. Pollution Tolerant Index, EPT Index, Predominant Taxon Ratio). Our sample achieved a 'good' rating (the highest rating) across all four indices. The most abundant aquatic invertebrates in the samples were caddisflies. Their cases (houses they build themselves and attach to rocks) could be seen all over the rocks where the samples were taken. There were also mayflies, scuds, aquatic works, leeches, water mites and stoneflies captured. The prize catch of the day were two giant stoneflies, which measured nearly 5 cm in length. A great find! Two large stoneflies. Data was uploaded to the Pacific Streamkeepers Federation website and is available HERE.